Eric Berry, the former Tennessee Volunteer, is now playing safety for the Kansas City Chiefs. Here he is standing infront of his black Chevy Tahoe with 26″ Giovanna Dalar 6V wheels with a matte black and machined two tone finish. 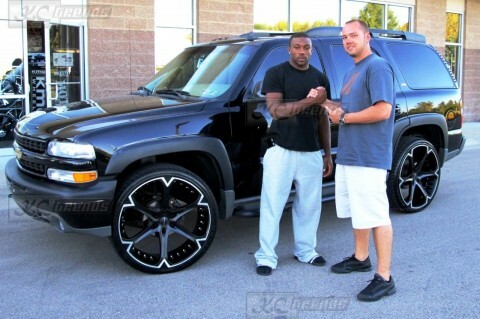 Like most of the Chiefs, he got his car customized by Chad Dearth at KC Trends in Overland Park, KS. The wheels have a very aggressive fitment of 26×10.5 all around. I think the 25 series tires are too thin for such a heavy car. I also think the 6 thin spokes on the wheel don’t really match the car. Great fitment but wrong choice of wheels in my opinion.